From the first moments, the first frames of film you see, it is obvious THE SHAPE OF WATER is going to be a feast for the eyes. Star Sally Hawkins’ Elisa floats down to her sofa in an apartment apparently full of water. it is balletic and soothing. 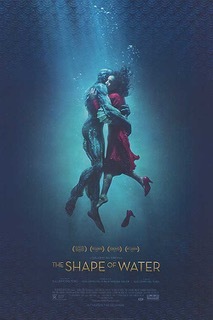 What is not so obvious right away is how Guillermo del Toro uses that languid beauty to set up a drama that is equal parts romance, monster movie and cold war spy thriller. Hawkins is a mute janitor at some kind of government ocean research lab. Her life is routine. She wakes up, makes breakfast, takes a bath and goes off to work. She also keeps track of her neighbor, Richard Jenkins. He is another lonely soul in a film loaded with them. One day the lab is buzzing because of the arrival of a new “project”. The mysterious container is wheeled into a lab and a curious Elisa puts her hand on the glass window and something jumps at the glass. Later Elisa finds out it is some kind of amphibious man that is ominously referred to as “the asset”. Michael Shannon is the government agent in charge of the project. He treats the “asset” without compassion or regard for its wellbeing. He is focused on results, getting something out of it before the Russians discover it. He walks around with an electric cattle prod which he uses viciously in one brutal scene. Michael Stuhlbarg is a scientist in charge of studying this amphibious man. Elisa finds a connection with the creature. Her non-verbal communication works to her advantage. She is not constrained by language. The connection soon turns to love. And when she learns the creature is doomed, she devises a plan to rescue him with the help of Jenkins and her fellow janitor Octavia Spencer. At its heart THE SHAPE OF WATER is a romance about lonely outsiders who find each other. Each main character has an “otherness” about them. Elisa is mute. Jenkins is a gay, former graphic artist who apparently had some kind of drinking problem. Spencer is African-American (in this time frame, she is an outsider). Shannon is alone in his own villainy. Stuhlbarg has his own outsider story that is too key to the plot to reveal here. They find themselves intertwined trying to deal with the ultimate outsider, a sentient fish-man. But their interactions are all unique, for love or country or loyalty. del Toro weaves the three themes I mentioned earlier without a hiccup. The stories come together flawlessly. The message is clear, but he doesn’t beat you over the head with it. The visuals wash over you like the water that is a running idea throughout the film. It is engrossing. You are sucked in by the romance and beauty. You are kept intrigued by the spy thriller elements and the desire to see if love will indeed conquer all. I had a couple of small issues with the film. One involves what I thought was a completely unnecessary scene where Jenkins hits on a counter-boy at a pie shop. I didn’t need to know more about him. It was a little distracting. The other involves a climactic scene between the creature and Elisa. I don’t want to spoil anything, but it didn’t feel honest to what we had come to learn about her. del Toro is a genius in the genre of monster movies. The HELLBOY films, PAN’S LABYRINTH and PACIFIC RIM are examples of how he is more about shock and awe. He is about heart and feeling. It really is a wonderfully amazing skill to make these types of films more accessible to everyone. THE SHAPE OF WATER has everything an Oscar voter could want. And that is good news for audiences too.